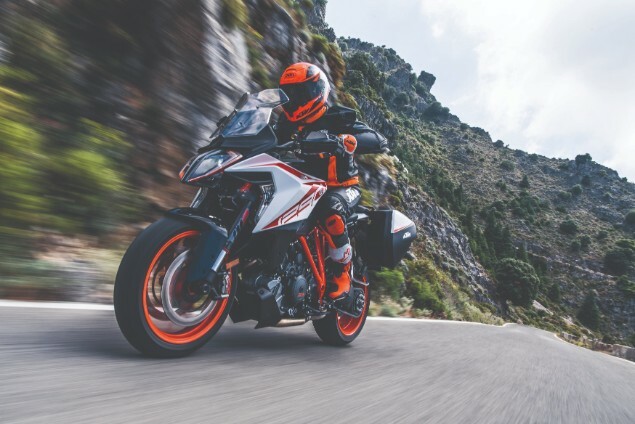 KTM’s 1290 Super Duke GT is a powerhouse sports tourer packing a 175bhp, 1301cc V-twin and the bike has been given a mild refresh for 2019 with the addition of some new standard equipment and technology. The biggest changes can be found in the cockpit area of the bike thanks to the fitment of a new 6.5in Thin Film Transistor (TFT) screen which is mounted behind a newly designed windscreen. This new screen is controlled by a series of backlit buttons on the left handlebar. New for 2019 is the fitment of a quickshifter that works both up and down the gearbox and allows for clutchless gearchanges. The Super Duke GT has the very latest version of the 1301cc, 75° V-twin LC8 engine which was recently updated with revised resonator chambers, titanium inlet valves and new engine mapping to liberate the full 175bhp and 141Nm of torque. 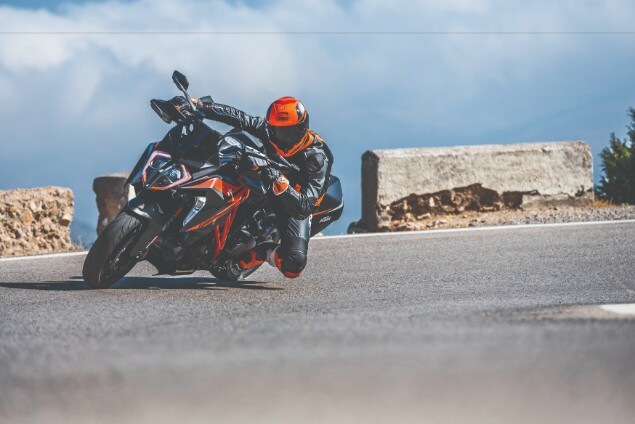 The KTM 1290 Super Duke GT boasts some of the most advanced electronic rider aids available with cornering ABS, traction control, multiple rider modes and even a track setting that allows more adjustability for faster riding. 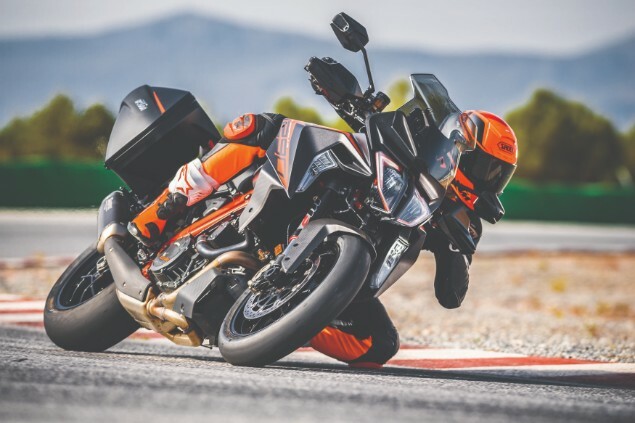 The Super Duke GT also has the very latest semi-active WP suspension with sensors constantly working to adapt the suspension to changing surface conditions and it can be set-up to work at its best with a single rider, with a pillion, luggage or any of those combinations. There are three available settings of Comfort, Street and Sport available. In keeping with the touring ambitions of the bike, KTM has added new storage compartments to the fuel tank side panels so you can store a credit card or tollbooth tickets when travelling long distances. One side has an internally mounted USB socket to charge electronic devices while riding. Heated grips are standard. 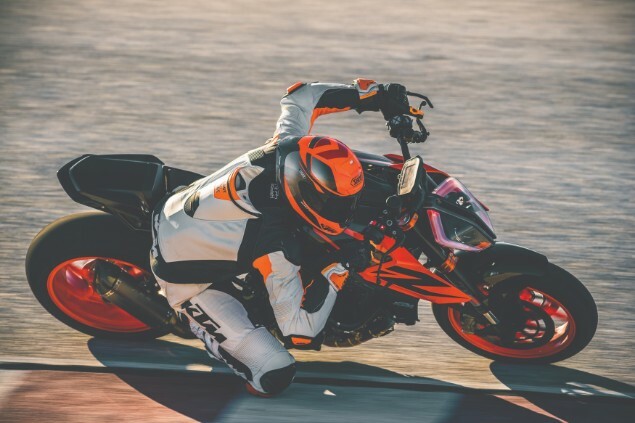 The updates to the Super Duke R are restricted to just new graphics for 2019. With 177bhp the Super Duke R is already one of the most potent of the naked bikes available and was only updated recently. The optional ‘Track Pack’ includes launch control, wheelspin adjuster, three throttle response settings and you can turn the anti-wheelie control completely off.